The animated picture below shows how the sun actually moved over the period of the full year. Technical skill, planning, patience and diligence are the keystones to a project like this. People who know me will vouch that I have never been particularly well endowed with three of these vital qualities; technical skill being my only forte. Now that I have successfully completed this project, the realisation has dawned on me that planning, patience and diligence are not qualities that one is gifted with, they must be cultivated. A valuable lesson indeed. While I was preparing for this project, I scoured the internet for information on how to go about doing it. While there are plenty of Analemma pictures available (including the fakes), I could not find a comprehensive tutorial on the technicalities of photographing the Analemma anywhere. So I have listed some technical issues and lessons I have learnt below, as a guide to anyone who would like some pointers on how to go about it. First, I had to choose a suitable time of day to take each picture. This time would remain fixed throughout the entire sequence. It had to be late enough to make sure the sun was clear of the tree top line in the winter and early enough that I could take the shot, shift my gear inside and still be able to drive to the office in time. I chose 08:05:00 (GMT +5.5). Since the sun’s disc subtends an angle of only about 0.5 degrees,and moves through the sky at 0.25 degrees per minute, accuracy in timing is critical. This means a timing error of just 15 seconds would cause the sun’s disc to be out of position by 1/8th of its diameter. Just before setting up for each photograph, I synchronised my watch with this internet time service. Each shot was exposed at exactly 08:05:00 and considering inclement weather (cloud cover), I left a gap of about 14 days between successive shots. It would have been ideal to attempt 52 perfectly spaced images (one every 7 days) but the Indian monsoon clouds (July – October), holiday plans, weddings, and my schedule of out station travel prevented me from doing this. This is why the spacing between the sun’s images is not uniform. To observe the sun’s movement over the year, all exposures need to be carefully aligned with the same reference object. This ensures that the camera’s frame of reference remains rock steady over the year and the sun’s image moves gradually through it. 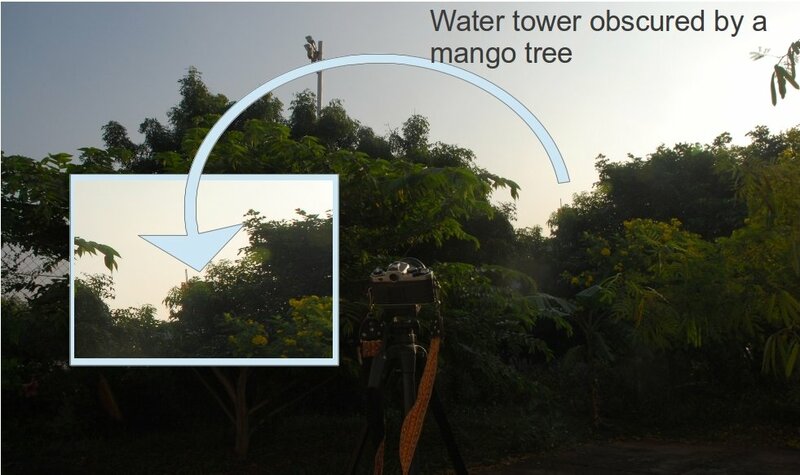 I used my neighbour’s rooftop water tank as my reference object but I realised soon enough that I hadn’t catered for the growth of a nearby mango tree that would almost entirely obscure the water tank by the time I finished the sequence (On the flip side, I now know that a young mango tree grows about 3 metres in height every year). If you look closely at the lower right corner of Dennis di Cocco’s classic Analemma image, you will see a tree that grew in size over the year, obscuring part of the figure-of-eight. One can use a professional architectural focussing screen (with a built-in alignment grid) for precise alignment, but these are terribly expensive to come by (for digital cameras) and I settled for aligning my reference object with the central focus point on my D40X’s kit screen. As you can see, the results are fairly accurate. I did however use a Nikon Type E focussing screen for my Nikon FE film camera’s Analemma sequence, and I would definitely recommend using one. I cannot stress this enough ->Proper alignment is the MOST important thing to remember while photographing an Analemma. Half a degree of alignment error (just a nudge of the tripod) would be equivalent to a timing error of no less than 30 seconds. This is why I would recommend the alignment be carried out with two permanent structures in line (also called a transit) with each other. The sensitivity of this alignment method is much improved by ensuring that the distance between the camera and the closer object is many times smaller than the distance between the two objects. It’s very important to use a lens with a proper focal length for a task like this. Using my astronomy software Getafix, I calculated the extremities of the altitude and azimuth of the sun at exactly 08:05:00 over the period of a full year. I then used a little spherical trigonometry to determine the angular separation between these extremities. 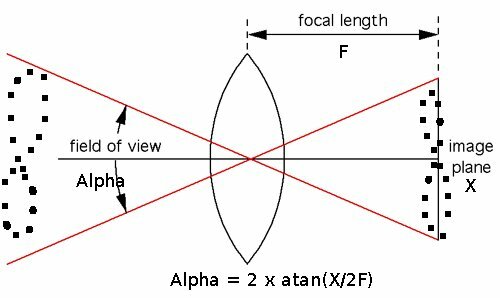 Using this value, and the formula below, I determined that an effective focal length of about 28mm would be needed for the full sequence to be captured in one frame. Accordingly, I set my D40x lens’ focal length to 18mm (effective FL about 27mm catering for crop factor). At each exposure, I needed to ensure that my camera captured only the sun’s disc. The sky, clouds and trees would need to be blacked out of each picture. To do this I used a variable Neutral Density Filter. Rotating the outer collar allowed me to adjust the filter’s density and black out everything but the sun’s disc from each shot. This done, I made fine adjustments to the exposure with the shutter speed and aperture settings on the camera. Looking at the result, I think I may have got more consistent results with a good quality ND8 or ND12 filter rather than a cheap Chinese variable ND filter. 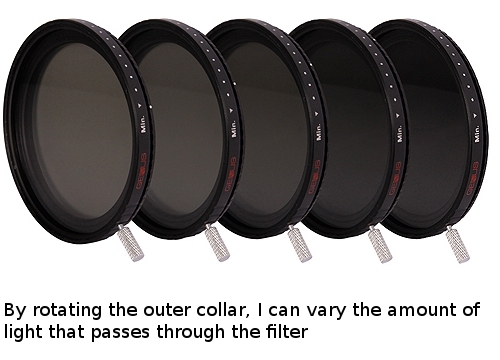 A variable Neutral Density filter like this one allowed me to select how much light would enter the camera. Over a year ago, when I began this project, I planned to capture two separate renditions of the Analemma. The more challenging of the two would be attempted on film, something has been done only a handful of times in the entire history of humankind. I chose the Nikon FE 35mm film camera for this purpose since it has the ability to capture images without needing to advance the film after each shot. After six months of effort, and about halfway through the sequence, I allowed myself to become momentarily distracted by a telephone ringing in the distance and accidentally cranked the film advance lever without first pressing the multi-exposure lever, thereby ruining the entire sequence. Alas, the exercise was valid ONLY if I managed to complete it on a single frame of film. This tiny lapse in concentration has cost me dearly and today I am left with only a digital camera image from my D40X. 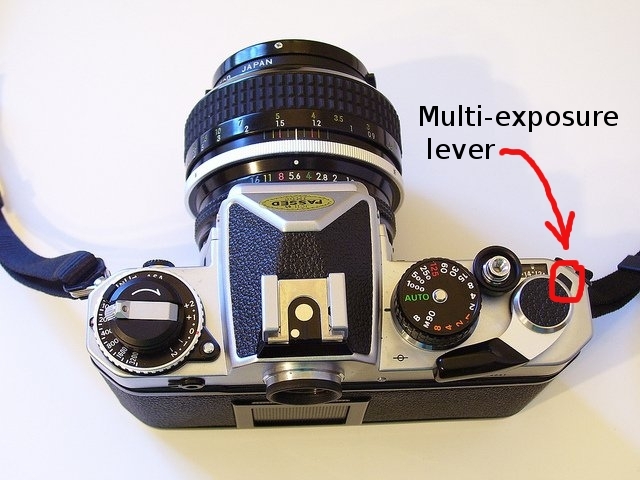 On my Nikon FE, I must first press the multi-exposure lever BEFORE cranking the film advance lever. This resets the camera for the next shot without moving the film forward, allowing me to capture multiple pictures on a single frame. I used the GIMP to merge all 26 images of the sun. Adding an alpha layer allowed me to remove the black parts of each frame, leaving only the sun’s disc on a transparent background. 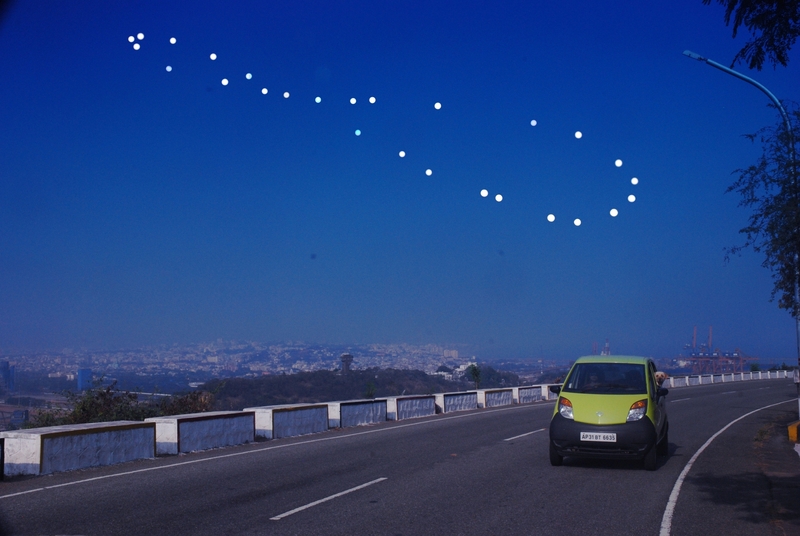 I merged these together and superimposed them onto a landscape shot of Visakhapatnam seen from Dolphin Hill, resulting in a completed image of the Analemma. According to this astronomy website, capturing an Analemma is a project that only a crazy person would attempt. In my books however, it feels like this has truly been a rewarding exercise, both in the application of technical skill and as a lesson in character building. For those readers who are interested, I have written more about the Analemma, and the mathematics that cause it, in this blog post. This is a list of all analemmas ever captured that Maciej Zapiór and Łukasz Fajfrowski have compiled. As you can see, the list is short, and if you scroll to the very bottom, you’ll see my name on it! You can see their incredible solargraphy analemma here. I wonder if I will ever muster the determination to attempt this again, just to realise that final elusive goal, capturing an Analemma on a single frame of film. This entry was posted in Earth Fire Air Water, My Struggles and tagged Analemma, first analemma in India, how to, Nikon FE, procedure, tips, tutorial by vu2aeo. Bookmark the permalink. IT THE INTEESTING . I THE CONCUR THE CRAZY PART FULLY. happy to hear that you have captured the analemma. inspiring as usual.congratulations for achieving this. Congratulations! Interesting thing it that we have just finished our Solargraphy Analemma Project which had almost the same exposition period: from March 1, 2013 to March 1, 2014 but located in Poland. Thanks!! I would love to see your results….do you have a link I could visit? I have already noticed that you have found our webpage http://www.analemma.pl. Please write me an e-mail I will answer you. I too hated the idea of photoshopping a background, but after my ‘film’ attempt failed, I really had no option but to put in an artificial background. 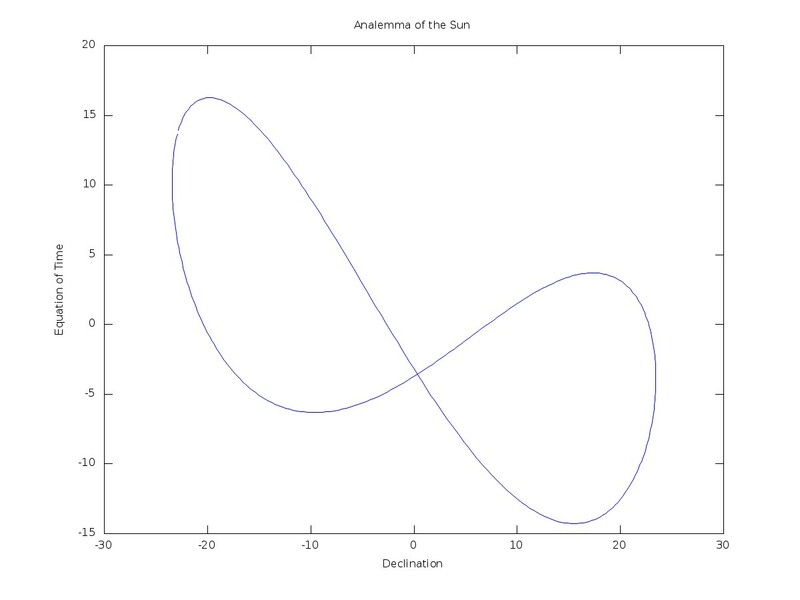 Thanks for finally writing about >Capturing tthe Elusive Analemma | Bayesian Adventures <Loved it!